Cate: Please welcome Karen Michelle Nutt to my special Halloween celebration. Karen, please tell us a little bit about yourself. Karen: My name is Karen Michelle Nutt and I’m an author of paranormal romances, writing for Tease Publishing LLC, The Wild Rose Press, Highland Press and Victory Tales Press. Cate: Love it, very cool. What do you love most about Halloween? Karen: I love the decorations. Ghosts, witches, vampires, werewolves, bats—you name it, I can’t wait to decorate the house. The fall colors are beautiful with those different shades of rich orange, red and yellow. I have a quite a few ghost stories. Must be why I love the paranormal so much—it feels like home. When I still lived at home (yes, that was eons ago) it was late and my mother and I were the only ones still up. (I’m the oldest of five. At the time this happened, my youngest sister wasn’t born yet.) I was working on a report for school in the kitchen and my mother was in the bathroom taking a bath. She kept the door slightly open so we could talk. “I said who’s up with you?” She couldn’t hear me because of the water running. Now I’m freaked. She sees someone and I don’t. I run into the bathroom. “No one is up with me.” I do believe I did a little dance of fright and my voice became shrill. My mom thought one of my younger brothers or sister had slipped out of bed. Cate: Glad she's friendly! Ever gone on a ghost tour? Or ghost hunting on your own? Karen: Love ghost tours. My husband and I try to join in on a ghost tour everywhere we vacation. Two of my good friends also like to go with me on ghost tours. They’ve all been different ranging from revealing the local legends, pure entertainment to a serious ghost hunt with a parapsychologist. A few Ghost Tours I’ve been on: The Queen Mary, Hollywood Cemetery, Hollywood Movie Stars, Gettysburg, St. Augustine the city tour and the lighthouse tour the Ghost Hunters investigated, San Diego, Boston and Salem, Eastern State Penitentiary (Ghost Hunters went there, too. ), San Francisco, Ireland. I’m sure I’m missing a few. I posted quite a few of the pictures and information on my blog, KMN Books Blogspot and Author’s Den if anyone’s interested in knowing more about these places. Cate: You'll have to let me know if you come back to Gettysburg! Tell us about your release, and where readers can find it online. There’s four stimulating stories to satisfy your romantic cravings. My tale is The Curse of Tempest Gate. Blurb: Clarity Shaw, a reporter for Unbelievable Finds, seeks answers concerning the curse of Tempest Gate Cemetery. Warnings from the Bed and Breakfast’s receptionist and an old man only make her more curious. 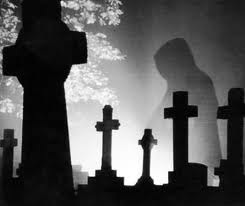 Determined to get her story, Clarity ventures into the old cemetery. Even though she is tied to the legends surrounding Tempest Gate through her ancestry, Clarity does not believe in the paranormal. She intends to collect the local versions of the stories, take some photos, and be on her way. A beautiful sculpture in the cemetery, a stone angel warrior, draws her attention and her admiration. Could this be the Archangel Michael? Then she finds out more than she bargains for when she sits in the devil’s chair on the eve of Halloween. Two entities need her for their own personal reasons, but only one will demand her heart. Cate: Care to share an excerpt? Karen: She chewed on her lower lip, debating if she should give the chair a try. “The stories surrounding the chair were meant to scare people,” she reminded herself, trying to forget Hester Higgins ominous warnings about the entity of Samael feeding off a person’s deeds. “Sordid deeds.” Her worse offense was taking extra cream home from the nearby coffee shop to use later at home. She couldn’t imagine Samael getting high off of that. Besides, the legend of the chair was probably invented to scare away vandals. With a shrug of her shoulders, she plopped down in the chair, facing the Archangel Michael, who appeared to be eyeing her with disdain. “Don’t look at me that way. I had to sit here. I work for a magazine—and I’m talking to a statue.” She shook her head. It must have been the knock to her head. It made her loopy. She lifted her camera, facing the lens toward her. At arm’s length, she snapped a self-portrait of herself sitting in the chair. She looked at the picture on her screen, thinking it looked okay, but something in the corner of the photo caught her attention. The clouds shifted overhead and the photo became shadowed. She had to magnify the picture, bringing the image closer to the screen. Her heart beat faster in her chest. A shadow in the shape of a man stood behind her off to the left of where she sat. She whipped around in her seat, half expecting to see the figure looming over her, but there was nothing there. The shadows deepened overhead. With a frown, she glanced up at the storm clouds moving in fast from the other direction to join the ones hovering overhead. She had to go now. Her windbreaker wouldn’t repel a downpour and she’d end up drenched. She flew to her feet, but something whipped around her waist like a vice and yanked her back into the chair. She let out a gasp of surprise as she glanced down at the ivy wrapping around her, binding her as securely as ropes would. She struggled against the plant determined to keep her prisoner, but her fingers were useless against the vine’s strength. You’re sitting in the devil’s chair. The annoying voice in her head reminded her in a tone of how-stupid-can-you-get. A scream crawled up her throat in a roar of denial. “Demons are not real! They are not real,” she yelled again. “Oh, but they are,” a deep voice momentarily broke through her tirade. Her limbs froze and her heart threatened to stop. The Archangel Michael stepped down from his base, his wings spread wide in a ruffle of feathers that sliced through the air. He no longer was a frozen stone effigy, but flesh and blood. His hair was seven shades of gold and his eyes as blue as the sky. Her mouth dropped open, but no words left her lips. “I believe you asked for my service.” He bowed before her with a generous display of courtesy. She let the scream come loose, bellowing like a banshee set free to find its prey. Cate: Wonderful! What inspired you to write about the theme? The Curse of Tempest Gate is a new Halloween legend. The words blazed a trail across my computer screen with the story about a witch's curse, ghosts playing havoc and archangels dueling it out in a cemetery. All this from just one photo. I guess it's true, a Photo is Worth a Thousand Words or in this case about 19k. Cate: Gotta love that. :) Anything else you’d like to share? Karen: I want to thank you for having me here today and letting me share my tale. Cate: Thanks so much for being my guest Michelle! Welcome Karen! I meant to say I love the name of your heroine - Clarity. Very cool! Did you name her that because the premise came to you so clearly through a picture? That was a really creepy about the little girl ghost reaching for you. Yikes! That's a great ghost story. Gave me the shivers. I have one, too, but it's too long to post in a comment. Wow! Your excerpt gave me the creeps. As Clarity was debating it, I felt like screaming, "don't do it!" Love the name of your heroine, btw. It's perfect for the story. The Curse of Tempest Gate is one of my favorite stories I've read this year. And very befitting the Halloween season. Congrats on all your recent releases. Thanks so much for having me here and letting me share my new Halloween tale. Let me tell you, it was really creepy. Still chills the bones to this day. You just teased us with a ghost story and didn't tell. lol Well, if you change your mind, come on back and share. I'm so glad you enjoyed the excerpt! I was hoping for that reaction. I don't know how many scary movies I've seen, biting my nails and saying to myself, "No, don't do it!" I wanted the same thing here. Come on, Clarity--really? You're going to sit in the Devil's chair. Rebecca is the author of romantic tales with a twist. She is one of the authors of this anthology, too. If you have a chance, tell us a little bit about your story! My story is the last one in the Stimulating Anthology. I am fascinated by witches and old legends and what's Halloween without a haunted house or a ghost? Trudy thinks she must have lost her mind by agreeing to house-sit a huge, old, Victorian mansion during Halloween week. Lights switching on and off along with odd noises lead her to meet a certain, handsome police officer named Simon. The attraction is mutual and undeniable. Maybe the scare was worth the chance to go out with this guy. When odd things at the old house continue, Mina, Trudy’s best friend and partner in a vintage clothing shop, teases her about having a poltergeist. Deciding she can deal with that better than an actual person out to do her harm, Trudy relaxes a bit—until the ghost takes over on Halloween, revealing a curse and an ancient, haunting love. Rebecca will be back on Oct. 28 with all the blurbs from the anthologies! More Halloween guests will share their spooky fun in between too, so be sure to check back! Great blog. Oh Karen that was so spooky about the hand coming out, I would ahve screamed the house down. Sorry I'm so late--we've had storms just about all day long, then when it cleared a bit, the man was home and we had to go do errands. LOL I have to say, I haven't had any reading time lately, so I haven't gotten to read our anthology yet! Karen's story is first and I have read about 4 pages of it and never seem to be able to get back to reading for the last couple of weeks. It's killing me! BUT, I did finish ELI: WARRIOR FOR THE LIGHT, and LOVED it!!!! Eli was just phenomenal--soooooo hot, and such a good story! I am hoping that this next week I'll be able to sit down and have some "me" time one afternoon and actually be able to read the stimulating anthology. It's never too late to join the party. Once my mother knew it wasn't one of the little ones, she tried to act cool about it, but I overheard her talking about the incident with my dad. It freaked her out, too. Hi Karen, that was quite literally hair-raising. One personal experience with the paranormal is when I was at a friend's old house in New Delhi, India. I was staying over to help her and was completing an assignment while she went to hospital to care for her mother. I was in the study and there was a knock on the door, I invited the person in, but no one came in. A second clearer knock and I opened the door immediately but there was no one there. When it happened the third time I whipped the door open and again emptiness. Later she told me they thought it was the ghost of an Englishman whose house it had been during the British Raj in India. Okay, story gave me the chillies. My favorite story and one I think I've shared is visitng a friend's house in the country, sounds of feet walking down the overhead hallway to the open porch upstairs. She took me up to the second floor and had me climb out on the roof and look into a small room only accessible from the outside window. Inside was a long wooden box sitting on a raised bier. Looked like a coffin to me and I couldn't understand why she didn't tear down the wall and find out for sure what was in there. EEEUUUUW! Someone knocking but no one there-- that would have freaked me out, too. Or did he come in, but you couldn't see him. Okay--that would be worse. Thanks for coming by and sharing your ghost experience. A coffin like box sealed up in a room--yeah, I would want to know what was in there. I can't believe they would just leave it. Thanks for coming by to add a few more chills. Oh, but what if unsealing it loosened something awful -- like Pandora's Box??? But then again, I don't think I could live there knowing a coffin like box was sealed in a secret room. Very EERIE!!! What an awful decision to have to make. Sounds like a great basis for a story.